Simple and user-friendly – there is no limit to what you can achieve! Beautiful graphs, charts and other visualisations of results. With lock screens that provide full progress control. Participants answer when it suits them best. Register background information for better insights. Presenter view for more control or Mirror view for easier set-up. Embed a video by simply pasting a URL. Allow full anonymity at login or when displaying live results. Full control of your data. Encrypted storage of all user information. You should be able to make Diggles that makes sense for your business. That’s why we provide a wide range of exercise templates. Whether you are embarking on a challenging workshop or conducting a simple Friday quiz – Diggle has what you need. Whether you are embarking on a challenging workshop or conducting a simple Friday quiz – Diggle has the exercises you need. Replace the sticky notes in your workshop session. Quickly generate and capture ideas, assign to categories, vote and prioritize. No more rework. Assessment of market opportunities or threats? Analyze the organization’s visible and hidden cultural features? The iceberg provides a clear visualisation when analyzing uncertainties. Ask questions using multiple pictures. Sort the participants into demographic groups to analyze the responses more accurately. Present your case and ask participants to position themselves from red to green. Collect and analyze visible and hidden challenges. Replace the sticky notes in your workshop session. Quickly generate and capture ideas. Introduce a subject, problem or case using text, video or images. Lock screens gives you full progress control. The classic quiz template. A set of alternatives with one correct answer. A set of alternatives with multiple correct answers. 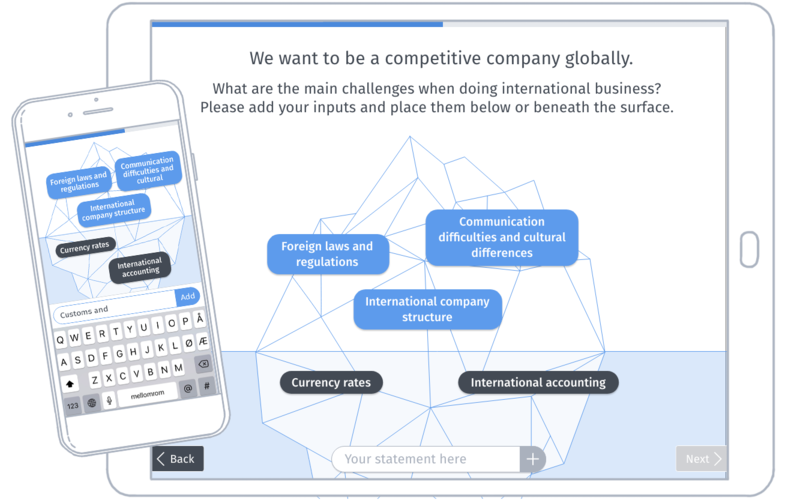 Lets your participants answer the questions in their own words. Gather opinions and identify trends with instantaneous voting. Answer questions or rate statements using scales. A quick way to gather useful data. Sort options as a correct sequence of actions or simply by preference. Compare multiple quantitative variables and get insight in more complex matters. A statement with two alternatives. True or false? This or that? You decide. Short inputs displayed in an evolving cloud.